[Background] Laparoscopic pancreatic surgery has been significantly developed since 1994. 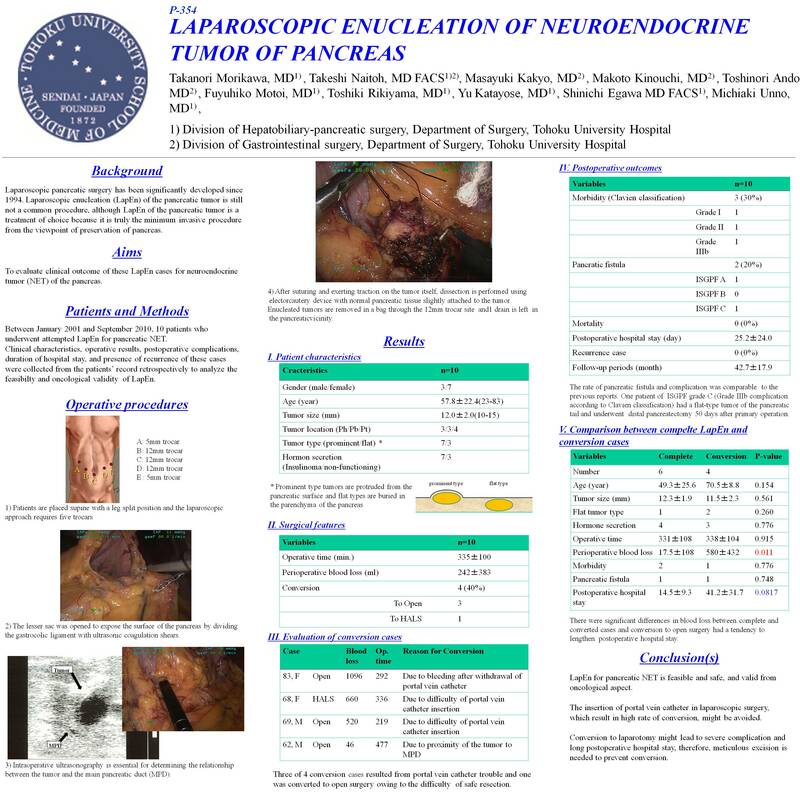 However, laparoscopic enucleation (LapEn) of pancreatic neoplasm is still not a common procedure, although LapEn of the pancreatic tumor is considered as a really minimum invasive procedure from the viewpoint of preservation of pancreas. Furthermore, the clinical outcome of this procedure is not well evaluated. We have been doing laparoscopic pancreatic surgery in our institute since 1998. In our series, we have 10 cases of LapEn for neuroendocrine tumor (NET) of the pancreas such as insulinoma so far. The aim of this study is to evaluate clinical outcome of these LapEn cases for pancreatic NET. [Patients and Methods] Between January 2001 and September 2010, LapEn for pancreatic NET was applied to 10 patients. Characteristics of these cases, operative results, postoperative complications, duration of hospital stay, and presence of recurrence were collected from the patients’ record retrospectively to analyze the safety and oncological validity. [Results] Ten cases included 7 female and 3 male patients, and the mean age was 57.8 y.o. (range 23-81). Tumor localization was as follows: three in the pancreatic head, 3 in the body, and 4 in the tail. Average tumor size was 12-mm (range 10-15-mm) in diameter. All of these tumors were confirmed as insulinoma pathologically. Three cases were converted to open procedure and 1 case was converted to Hand-assisted surgery because of the portal vein catheter trouble in 3 cases and tumor localization in 1 case. Therefore, 6 cases out of 10 cases underwent complete laparoscopic procedure. The duration of operation was 338 min in average and estimated blood loss was 18 ml in complete laparoscopic group, while duration of operation was 331 min and blood loss was 580 ml in converted cases. The median postoperative hospital stay was 14.5 days in complete LapEn cases and 41.3 days in converted cases. There were significant differences in blood loss between complete and converted cases. There was no surgical mortality. Postoperative complications were observed in 3 cases. Pancreatic fistula was observed in two patients. According to ISGPF classification, Grade C pancreatic fistula developed in one conversion case and Grade A was observed in 1 complete LapEn case. There is no pancreatic remnant recurrence in all the ten patients at the median follow-up period of 46.9 months (range 1-63). [Conclusion] LapEn for pancreatic NET is feasible and safe, but for LapEn, meticulous excision is needed to prevent conversion because conversion to laparotomy might lead to severe complication and long postoperative hospital stay.